I publish a monthly newsletter for In Other Words…, my editing, writing, and talk radio company. 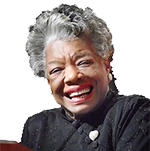 In June, my main article was an homage to Ms. Maya Angelou, who had died just a few days before, on May 28th. I’m not going to reproduce the whole article here, I’m just going to give you this one section. I want to display courtesy, courage, patience, and strength all the time. Now, I blow it 84 times a day. But I’m trying. I love that she put courtesy first. People think courtesy is just about manners. And maybe it is, but they miss the point of manners. Manners, courtesy, respect, they all say, “I acknowledge that you have as much right to be here, breathing the air, taking up space, as I do.” And I think that’s one of the best and most important things you can do for another person. All of your business connections, colleagues, clients, etc. have one thing in common: They are all people. Sounds simplistic, I know, but my point is that courtesy is just as important when dealing with them as it is in any other situation involving other people. Most of us sort of know that. We do treat clients especially with courtesy. But I think it is often more of a formality than genuine respect. We know you have to treat clients that way or they will not be happy. And an unhappy client is not going to be a client for long. I think what Ms. Maya was saying is that we have to truly believe it. We have to actually accept that other people have just as much right to be here as we do. And even that their opinions are just as valid as ours. They may seem absurd, they may not seem based in reality, but they are truly what that person believes and that person has a right to believe it just as much as you have a right to believe what you do. A person is not wrong simply because they disagree with you. You don’t have to agree with someone to treat them with respect. It was Evelyn Beatice Hall, in her biography of Voltaire – not Voltaire himself, as is often thought – who said, “I disapprove of what you say, but I will defend to the death your right to say it.” That’s what I’m talking about.